North American demand for lightweight automotive materials will rise 5.2 percent annually to 22.3 billion pounds in 2018. Gains will be driven mainly by increasingly strict automobile fuel economy mandates. The dominant metals segment (e.g., aluminum, high-strength steel) will outpace polymers and composites. 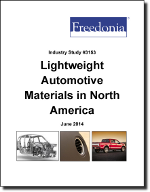 This study analyzes the 17.3 billion pound North American lightweight automotive materials industry. It presents historical demand data for 2003, 2008 and 2013, and forecasts for 2018 and 2023 by material (e.g., aluminum, high-strength steel, metal powders, magnesium, engineering plastics, polypropylene, thermoplastic elastomers, polyurethanes, rubber, composites) and application (e.g., engine and mechanical, exterior and structural, interior). The study also considers market environment factors, details industry structure, evaluates company market share and profiles 41 industry competitors, including Alcoa, Aleris International and SABIC Innovative Plastics.